This post is about Munin and the custom theme I built for it, Raven. Click here if “Load average” means nothing to you. What is Munin and why am I bothering with it? 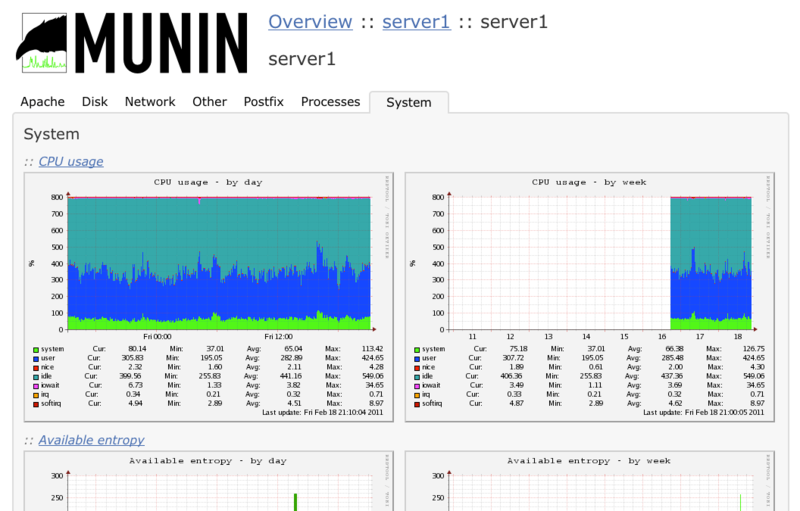 Munin is a program you install on servers to track their resource usage and application performance on a minute-by-minute basis and present you with graphs giving tons of detail about it’s status over time (each report can be viewed for daily, weekly, etc.) It has lots of core and community-built plugins to track different server applications and different aspects of a server’s health. The basic idea is that you install a ‘node’ on each server you want to keep track of, then one ‘master’ that queries the nodes and generates the graphs for you. I’ve had it recommended to me by pro sysadmins a few times in the past but was intimidated by the complexity of installation and the inscrutability of the resulting graphs, which depend on you having pre-existing knowledge of the command-line tools who’s output they aggregate. Oh, my iostat is up… um… what do I do about that? The best guide to understanding and installing Munin I found was this great set of articles on the Slicehost blog. They are intended for Slicehost customers, but seem to apply pretty well to anyone using the Linux distrubutions they cover. So I got it running and am trying to figure out how to read the information it presents but there’s a problem: It’s woefully, sinfully and abysmally ugly. The web pages output by munin are not just composed on 90’s style tables, they are ugly tables, with tiny text and wasteful spacing. FWIW I don’t even know how to refer to this. The files themselves are called ‘templates’ in various places on the Munin site, but IMHO the package as a whole should be called a “theme”, at least that’s how we do things in WordPress land. I tried to use both in this post so people find this post, but I’ll call it ‘theme’ from now on. Screenshot of Raven. Click to enlarge. Compare with screenshot of alt-default theme. Larger text all over to actually use up all the empty space created by the unavoidably-large graph images. Reduced unneeded spacing and <hr> tags that just added noise. Calm light-grey colors and rounded corners to soothe your mind while you toil over server performance. Readme/installation instructions in the .zip file. If I get good feedback about this I’ll post it on the official Munin Wiki, but for now you can grab the zip file above. Please take a look at the contents and read the README-INSTRUCTIONS.txt file before installing the theme. Upload the ‘raven-htmldir-files’ directory from this zip file into your Munin HTML directory (where the public HTML is served from). Edit your “munin.conf” file on the master and change the “tmpldir” property to reference the new “templates_raven” directory in your Munin config directory instead of the default “templates”. Wait 5 minutes for the Munin master to refresh itself and reload. Obviously this is my first attempt at a Munin theme and there is not a lot of other examples to emulate, so I may have done something horribly wrong. If you have questions or comments please use the comment form below to let me know about them. I will try to get back to you ASAP but be warned: I am not going to support your Munin problems for you. I am sharing this theme to give back to the community, but if your problem is complicated I may not be able to help. Thanks in advance to anyone brave enough to try out the theme and leave feedback! Works fine for me! I’m liking the tabbed interface. Your template is missing a lot of required files. I used the ones from the standard template, but alas that did not work either. I get a near blank page when I load the munin page in a browser. Hi alex, glad you found my theme and sorry it didn’t work for you. Do you know where i can find a list of required files? I built it based on munin 1.2.3 so if you are using a new version that could be part of the problem. I dont see why missing images would make the whole site not work, so I bet it’s not the images that are breaking it for you. Which install method did you use? Did you ever change you minion templates successfully before? I copied logo.png, logo-h.png, favicon.ico and the partial directory from the original tmpldir, but no luck. Alex and Jovito, did you guys watch the page loading with the ‘net’ tab in Firebug? Maybe there is a file that isn’t loading. More likely it’s an issue with more recent versions of Munin and Dougal (the only person who’s confirmed it works so far) is using the same old version as me (which is also the version you get by default with CentOS5 YUM repo). I believe that the template variables have changed in the more recent versions of Munin. Tried installing on a new machine and noticed a few errors. Note: I haven’t changed the comparison templates. Seems that things are not included. I love the theme, and glad someone finally took some time to make one that doesn’t look like it hasn’t been updated since 1998. I picked up Kim’s version (since I’m running 1.4.4) and still had a little trouble at first. It turns out that it seems to be hardcoded somewhere to look for style.css, favicon.ico, logo.png, and logo-h.png and fails if even one of those files are missing. So, I copied raven.css and renamed the copy to style.css, copied munin-logo-305×80.png to logo.png, then copied the other files from the default. Also, do you happen to know if it’s possible to see stats by a smaller unit than day (such as hour)? This looks great but I noticed the day/week/month/year comparison pages are broken. Did you ever get that working? John – What version of Munin are you running? Also, what appears “broken” about them? Those pages appear fine to me on 1.4.4. I confirm, the Kim’s version fix works for me. Munin version 1.4.3; thanks! Thanks to your work here, along with Kim’s and Shauna’s tweaks, I’ve now a much nicer looking munin page. I do wish there were more options for templates though. Anyone think a munin template website would help with the lack of templates? I do have the server for it and php/mysql/html experience. Anyone have a template for 2.0? jer, no-worky w/ munin 1.4.5. Big logo appears, but the bottom section never does… Dangit! I can’t stand how ugly it is either. I’ll try to debug it when I can. Chris, are you using Shauna’s version? It seems like several people have confirmed it works with 1.4.4, so you’re saying that 1.4.5 breaks it? I still haven’t set up a 1.4.x testbed but was going to post Shauna’s package on this site for people using it. If it won’t work for the latest version maybe it’s not worth it. jer, I think I’m using yours – I can give Shauna’s version a try and report back though. Please host it here – the link above is horked. Jer, all good. My bad. I was looking ay the wrong link. works great – Thanks so much for creating this (and to Shauna for making it work with the latest version). If you have not pushed this upstream, you really should. They should make this the default theme. I made some changes to make it work better in my 1.4.6 munin setup. If anyone is interest, you can get the theme here. The main change is that comparisons are working now. Hi, I liked your template when I was using 1.4.6. I’ve updated to 2.0.6 now, and even though now you get to see what section you want in an easier way, I was wondering if you had any plans to update your template to the newer version? I have registered new domain as well as got the hosting server. i have uploaded source code under the public_html folder but my home page not coming when i run site on url. its redirect to ‘Munin Overview’ page. what should i do to render my home page?. 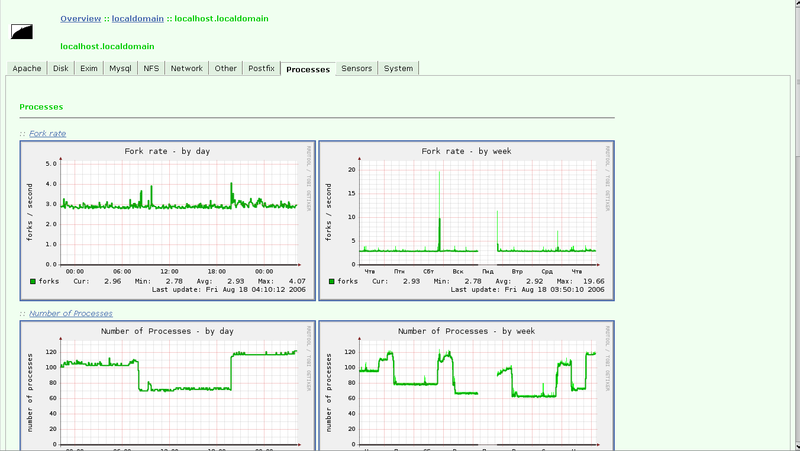 I have setup munin server of version 2.0.25, latest version. Do you have any plans to update your templates to compatible with latest version ? I love your work with templates which you did with older version.